This new production by the ENO of Thomas Adès’ Powder her face at AmbikaP3 was a thrilling exposé of a decadent life’s fall from grace. Very topical, given the current rounds of sexual exploitation by celebrities, this work also forces the audience to confront the duel standards by which society views sexual equality. The libretto by Philip Hensher, known for his journalism and novels, could have taken a more damning view of female celebrity, but instead its straightforward exploration of excesses, prejudices, and scandal allows the audience to be shocked by a world we hoped had gone away but that we know is still bubbling beneath the surface. Adès’ music conducted by Timothy Redmond added an emotional depth to Hensher’s writing. Fragmentary hints of tango and tearoom dances helped consolidate the era of decadence and gave life to the words. Loosely based on the life of Margaret Campbell, Duchess of Argyle, Powder her face was meant by Adès and Hensher (they claim) to be about a particular kind of woman rather than a strict biography. The main protagonist is referred to throughout as 'Duchess". In fact (Hensher states in an interview reproduced in the programme) some of the details made up in the opera have since become attributed to the Duchess of Argyle, for example the line "Go to bed early and often". The real life Duchess was the daughter of a Scottish millionaire who lived in New York. She became a celebrity simply for being rich and beautiful - but even today there are those who have celebrity status for this meagre talent, if not less. A broken engagement a divorce, and several affairs, eventually led to her marriage in 1951 to Ian Campbell, the Duke of Argyle. Twelve years later this marriage also ended - this time sensationalised by the production of Polaroid photographs of her 'caught in the act'. When she denied that the pictures were of her, a jeweller was brought in to identify her pearls. The judge's summing up portioned all the blame for the divorce on the Duchess and her sexual appetite. Moving to a Park Lane hotel, she lived there until the money ran out - this was where the opera began and ended. Written as a commission from the Almeida Opera for Cheltenham Festival, where Powder her face was first performed in 1995, the ENO had chosen to stage this opera, not at the usual Coliseum, but at the University of Westminster's industrial space at Ambika P3, just opposite Baker Street tube station. The space was originally a construction hall, but with its concrete walls and stairs it could just as easily have been an appropriated car park. This new production by Joe Hill-Gibbins (his opera debut) used the space to its best advantage, and in fact the architecture gave the production team more to work with than a standard venue. The entire space was used as part of the experience. Even before the opera began we were taken past groups of Polaroids of a bemused man tacked to the stairwell, and past colour plates taken from old cookery books - the kind showing mysterious things in aspic or blancmange. This led us into the bar, where fortunately with chairs provided around the edges of the room for the weary. However, these were in darkness, which resulted in people trying to read their programmes using light from their mobile phones. From there we were walked through the backstage to the concert hall. This allowed a sneaky preview of the opera props: a carpet with a wind up gramophone, catering trolleys with trays of things in jelly, a lobster, and glasses of champagne. The opera was performed in the round, and the stage was already set with the orchestra jammed into one corner (the percussion were tucked away behind pillars – heard but not seen) with the appearance of a palm court orchestra. A magazine casually left on one end of the piano's music stand would become a prop later on. The other side of the stage was a pink boudoir of a dressing room complete with flock wallpaper, two stuffed dogs and stands with wigs. Between the two ‘rooms’ was a hotel workshop. The opera opened with the projection of a Polaroid high up in the walls. Similarly to the projection used during The magic flute, the place and date were handwritten on the Polaroid at the hotel workstation in real time. Clare Eggington as the maid laughing, and Alexander Sprague as the electrician/hotel boy, set the scene in 1990. Sprague in a fur coat, wig and lipstick was dressed up as the Duchess and together they ridiculed the Duchess' pretend modesty and past fame. 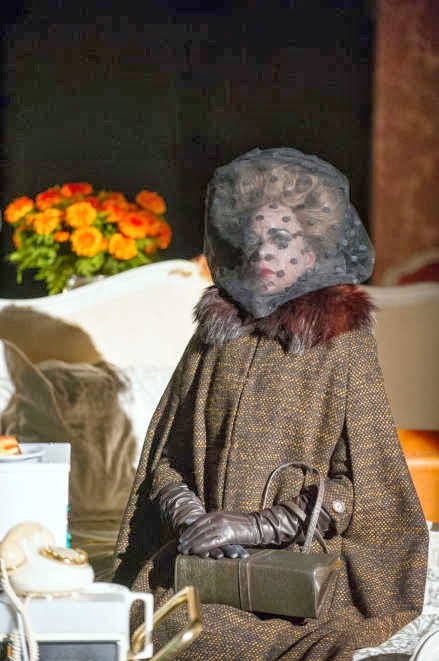 Enter the Duchess, also in a fur coat and even bigger wig. The impressive Amanda Roocroft was a multilayered Duchess - bombast hiding insecurity, promiscuousness masquerading as innocence. She tackled the intimacies of her role (yes that aria!) with conviction yet without compromising her music or diction. Her lyrical voice and delivery were exactly what was needed to bring the Duchess alive. The unusual setting left no room for surtitles – however I did not feel that they were needed. All the singers were perfectly intelligible. Yes maybe when you have duets, trios, etc with everyone singing different words all at the same time the exact words can be lost. But even when surtitles are present, they often stop at this point. One, it is hard for the surtitle writer/reader to keep track, and two, generally people are singing repeats of their current sentiment, and the actual words are not that important to understand what is happening. The rest of the opera unfolded as a series of flashbacks, each demarked by a Polaroid taken of an item or person on stage and then projected on the walls, working forwards again to 1990. The first couple of scenes built up expectation of the Duke, especially as young Duchess nervously awaits his arrival. His entry through a very brightly lit doorway gave him heavenly status. But we soon see that the couple are living separate lives and that he was as guilty of having affairs as she was. Each scene brought more furniture and props onto the stage, slowly filling up every available space. This visual pressure brought into stark contrast the end of the opera when the Duchess has lost everything and the stage was once more empty. The costuming was not flattering, more ordinary life than the mystery of stage. But despite the audience being so close to the stage leaving nowhere to hide, all of the talented performers bravely threw themselves into their roles - the men and Eggington sometimes in their underwear and Roocroft wearing a skin-tight lace catsuit for her scene in the bath. Eggington's maid was a vast contrast with her tightly controlled role as Miss Schlessen in Satyagraha. Both vocally and her acting skills came to the front, even from the very first ‘laughing’, amplified by interaction with the orchestra, to her portrayal of a variety of characters with different viewpoints about celebrities and about the Duchess. Similarly tenor Sprague and bass Alan Ewing, as the Duke/Hotel Manager, brought several different complicated characters to life. All three supporting roles demanded great vocal skill and all were ably sung. For example Ewing’s judge called for several different styles and vocal positioning to amplify the judge’s disgust and boy’s club mentality. Powder her face is running at Ambika P3 until the 19th April.